From Harry Potter to Game of Thrones, fantasy tales continue to capture our collective imagination across all ages and in ever-greater numbers. Enter Jeff Wheeler’s Kingfountain series. 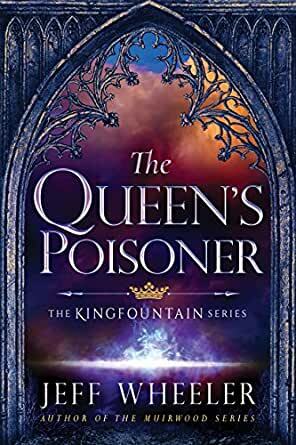 Beginning with The Queen’s Poisoner, the series introduces Owen, an eight-year-old recent hostage to the usurper king, and the mysterious queen’s poisoner of the title, whom Owen must learn to trust against his better judgement. As Owen adjusts to life at court, and as he begins to learn the secrets of the elusive and elegant Fountain magic bubbling within him, he struggles to navigate the culture of lies and shifting alliances into which he’s thrown, all while learning that his destiny may be more important than he ever thought possible. Through twelve novels and counting, Jeff Wheeler’s storytelling has maintained a singular knack for making everything else in my life rush to the background within a few sentences and then disappear completely. He weaves immersive worlds that forgo the explicit brutality of some popular fantasy sagas in favour of a deft touch that’s as welcoming as it is rife with conniving, trickery, heartbreak and beautiful, memorable magic. At least until I stop reading, these worlds take centre stage in mine. I should admit that I’ve already read the two sequels to The Queen’s Poisoner (both due out later this year), in which Owen ages from eight to seventeen to twenty-four. And I’m pleased to report that just when it seems as if Jeff Wheeler has achieved an imaginative apex, the story expands to envelop wider lands, richer magic, deeper intrigue and all-round higher stakes for Owen and the entire realm of Kingfountain. I’m sorely tempted to say more, but I wouldn’t dare rob other readers of the exhilarating experience of getting lost in Jeff Wheeler’s worlds on their own. Jeff Wheeler took an early retirement from his career at Intel in 2014 to become a full-time author. He is, most importantly, a husband and father, and a devout member of his church. He is occasionally spotted roaming among the oak trees and granite boulders in the hills of California or in any number of the state's majestic redwood groves. He is the author of The Covenant of Muirwood Trilogy, The Legends of Muirwood Trilogy, the Whispers from Mirrowen Trilogy, and the Landmoor Series. A lovely fantasy tale with the kind of mystery and intrigue I like. There was also a good mix of love and friendship. I have fallen in love with Owen, as most readers perhaps would, or will. I also loved the growing connection between Owen and Ankarette, and was heart broken at the end with what happens to Ankarette (I was under the bed crying with Owen). Good story, I am onto reading the next one. 5.0 out of 5 starsGreat start to this series! This being the first book that I have read of this author I must admit I was pleasantly surprised. It all flows together beautifully in such a way that you feel like you are actually there with the characters. The story unfolds with lots of twists and turns making it totally unpredictable as are some of the characters. Even the bad guys have their moments keeping you guessing as what really motivates them, and where the story is going. Owen must overcome his fears with the help of his new friends, and strive to reach his potential to ensure his survival. Definitely continuing with the series. 5.0 out of 5 starsA vulnerable hero survives against the odds. A fantastic read. Well structured with the hero, Owen, absolutely vulnerable from go to whoa. Enjoyed the themes in this story, finding them captivating enough that it was a struggle to put the book down. Owen's mentor and teacher was a vital life line, captivating and dangerous. A top foundation for what promises to be a fine series. What a great storyline this first book starts with. I was captured with 8 year old Owen Kiskaddon from the very beginning as the kings hostage and even more excited when he meets the mysterious Fountainblessed poisoner, best fiend and allie Ankarette Tryneowy, who teaches and shows him his powers at a very young age!! Very hard to put down and I was totally encaptured from page one!! A tale of treachery and intrigue told through the eyes of a little boy. Terrified at being sent away to the Kings palace as a hostage for acts of treason his parents have committed, Owen eventually finds comfort and help from people that have his best interests at heart. His new playmate Elysabeth VICTORIA Mortimer and he become firm friends sharing a series of adventures, mostly from her enthusiastic and adventurous nature, that almost get them killed only to be saved at the last minute. Along the way Owen realises his special powers and he must find a way to use them to save himself and his famiy from execution. 5.0 out of 5 starsWhat can I say, really? MASTER Wheeler is just that. A master of recognition, of words, and that special voice in your ear which reads for you, so your imagination can take over the images alongside those special words and moments. Master Wheeler, if I ever wear a hat, apart from my huge rumpled gardening hat, I shall allways salute you and doff my hat to you. (Actually, I already do that). Every child, teen or adult alike, in which whom I ever have had the privilege to know, will always sit down with me, as we read your books out loud, together. Three in particular, right now, have experienced with me, the joy, the heartache, the hope and the utter naughtiness of Owen and Evie, and look forward to our adventures in the next. Many of your books have we traipsed along, over and over. Discussions continuing for hours by the river bed, or on the pontoon in our own mysterious part of our imaginations. We thank you for your generosity in writing for us. 5.0 out of 5 starsAnkarette Twynneowe. This book can stand alone from the trilogy as a book for all ages, though I think young adults would like it better. As a beginning of a trilogy, it's enjoyable and makes me look forward to what's in store for the main characters.